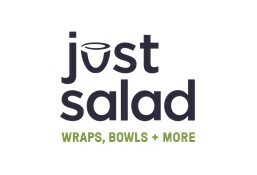 Just Salad is currently closed for delivery and it will open at 11:00 AM today . Romaine, chickpeas, crumbled feta, black olive, lentils, cucumbers, pita chips, olive oil and balsamic vinegar. Romaine, crumbled feta cheese, pita chips, lentils, cherry tomatoes, cucumber, pickled red onions, spicy tahini dressing. Romaine and red cabbage, grilled chicken, carrots, celery, crunchy onions, Asian sesame. Romaine, grilled chicken, crumbled feta cheese, black beans and corn, fresh jalapenos, tortilla strips, smoky poblano ranch. Romaine, buffalo chicken, cheddar cheese, tortilla strips, celery, butter milk ranch. Romaine, grilled chicken, sliced avocado, egg whites, cherry tomatoes, almond flakes, balsamic vinaigrette. Romaine, grilled chicken, crumbled feta cheese, pita chips, cherry tomatoes, cucumbers, pickled red onions, spicy tahini. Romaine, grilled chicken, cheddar cheese, black beans, cilantro, crunchy onions, sliced avocado chipotle vinaigrette. Romaine, tandoori chicken, crumbled feta cheese, pita chips, cucumbers, red onions, yogurt cucumber. Romaine, grilled shrimp, sliced avocado, cherry tomatoes, black beans and corn, crunchy onions, cheddar cheese, chipotle vinaigrette. Organic kale and red cabbage, chickpeas, organic quinoa, edamame, egg whites, crumbled feta cheese, balsamic vinaigrette. Romaine, grilled chicken, shaved parmesan, whole wheat croutons, smoky poblano ranch.